What is mobsync.exe? Should I remove it? mobsync.exe is a legitimate executable file, which is also known as mobile synchronization component of the Internet Explorer web browser. Its purpose is to make web-pages available offline. From the publisher: “With Internet Explorer, you can make pages available offline. You can use Synchronization Manager to set specific parameters for when your offline pages should be synchronized with the current cached page. To run Synchronization Manager, click Synchronize on the Tools menu. You can synchronize pages three ways: at logon, during idle time, or at a scheduled time. 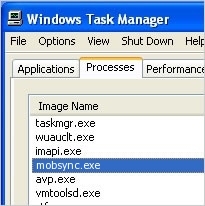 To set your synchronization preference, start Synchronization Manager, click Setup, and then click the appropriate settings on the Logon/Logoff tab.” So, if you found mobsync.exe running in your Task Manager, you shouldn't terminate it. However, if you think that it misbehaves and initiates problems, you can disable it by going into Task Manager and ending mobsync.exe. Any malware can be named anything! This is done for hiding dangerous files and preventing their removal. If mobsync.exe is located in order folder, not in C:\Windows\System32, you should check the trustworthiness of this file with a help of RegCure Pro. According to security experts, it has been used by WORM_SDBOT.CNT worm but noone can guarantee that other viruses won't be hidden using this name. Verduidelijk mobsync.exe bestand. Heb ik het nodig? Definire mobsync.exe file. Ne ho bisogno? Define o Ficheiro mobsync.exe. Preciso dele? This entry was posted on 2014-04-24 at 09:38 and is filed under Files, System files. You can quickly scan the QR code with your mobile device and have mobsync.exe manual removal instructions right in your pocket.